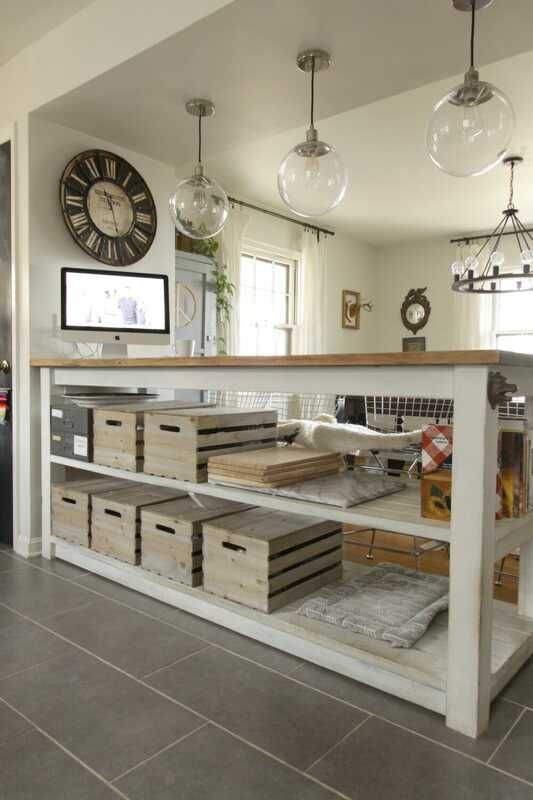 Our Industrial Kitchen Island with Storage from Crates & Pallet is sponsored by Crates & Pallet. All thoughts, opinions, and photography are my own. Thank you, to C&P for partnering with me! 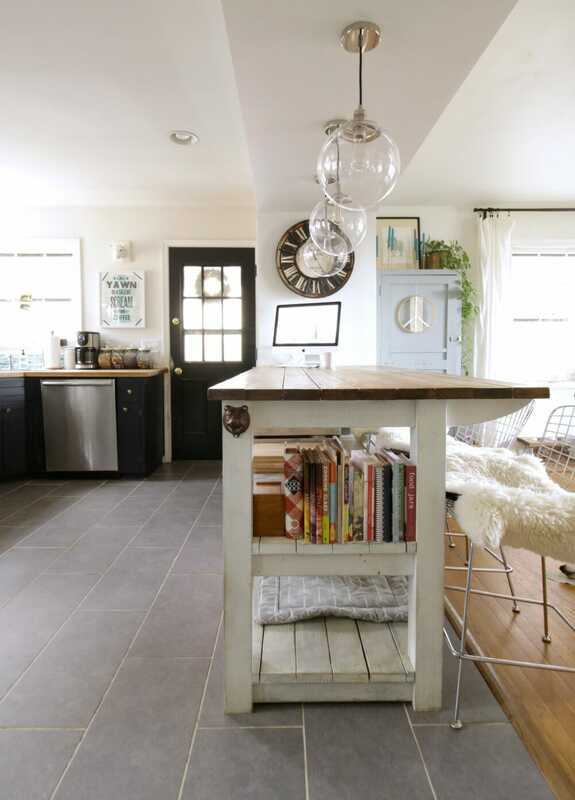 Almost exactly 3 years ago, I revealed my industrial kitchen island on the blog. This island has been an absolute workhorse and the perfect piece for us. My talented neighbor created the plans and built it according to my design. It’s large enough for us to sit as a family and eat meals, and as life has gone on its gained some new purposes as well. Today I am going to share a few changes we’ve made to make it continue to work for us, including better and cleaner looking storage, space for our furry family members, and most recently an office space for me. I also want to let you know that although I love beautifully staged photos… who doesn’t?… I am going to start keeping it a little more real for you. You might spy dog noses, a dog crate, and some dog toys if you look closely. You’ll see our computer on the island, because that’s where it actually will stay. I did clean for you, but I want you to see how we really live. I don’t know about you, but I certainly don’t live in a magazine. Let’s begin with the storage solution on this island. A couple of years ago, I shared all of the vintage finds that I used to organize my kitchen. Many of them are still in place, but one of the things that started to drive me a little crazy was the storage on the island. We originally had a few vintage crates on t he bottom shelf, and dish ware and miscellaneous kitchen needs on the middle shelf. Well, with a few playful dogs around here, some dishes broke so clearly those needed to be relocated or protected. As for the crates on the bottom shelf, they looked ok, but they were so open that dust just collected in them… gross. 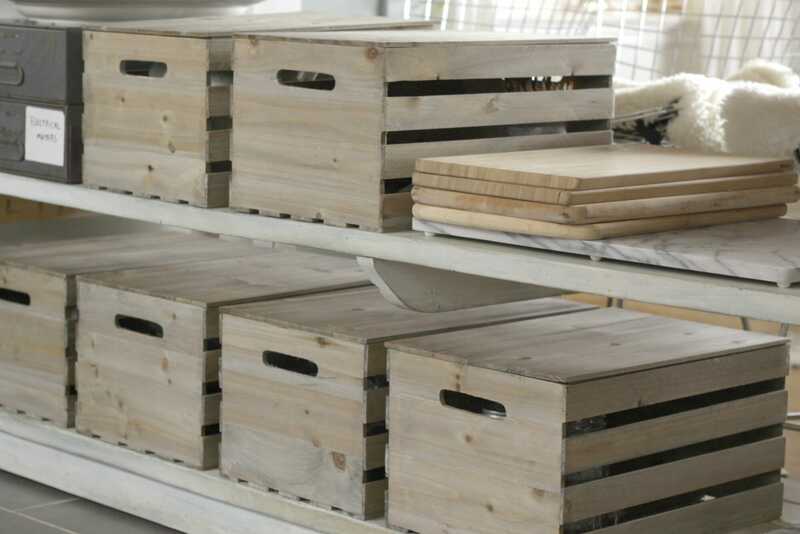 Crates & Pallet makes new crates with an older look and they have lids that can be purchased as well. Life-changing lids. I ordered 6 of the large weathered crates and, naturally, the complementary lids. They’re available in a vintage style weathered gray wash that suits our kitchen style well. I decided to replace the actual vintage crates with these, and add a few more to help hide and protect some of what was making the island feel too cluttered for me. The look is still vintage and industrial, but much more streamlined now. On the middle shelf, I keep several cookbooks in between the island posts, and I’ve also stacked my larger cutting boards. We have a large marble board (I received for Christmas and LOVE!) that I use usually once a week for homemade pizza, a meat board, a produce board, a carving board, and one extra. We actually do use them all. 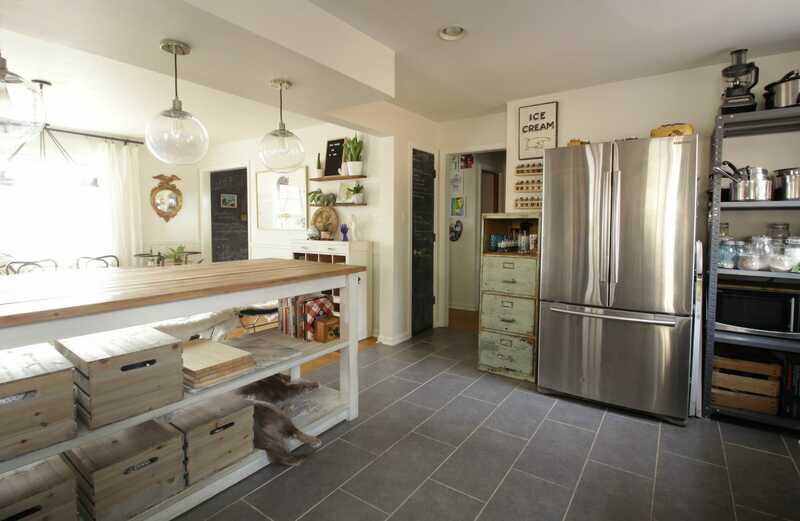 To the left on that shelf is a set of stacked vintage industrial drawers that hold miscellaneous utensils, skewers, and Emmy’s straw collection (seriously). I would love to have a crate there for a more uniform look, but the drawers actually work really well for us. From the other side of the island, the new crates keep everything looking much less cluttered as well. It had honestly become a bit of an eyesore if you were looking at it from the dining room. I am sure you are thinking, why not put all the crates along the bottom and make it uniform? I agree; that would be much more appealing. However, the dogs adore this space on the island and think it’s their little seat. Our Merlin Mat from Janery sits there to keep it cushioned for them. 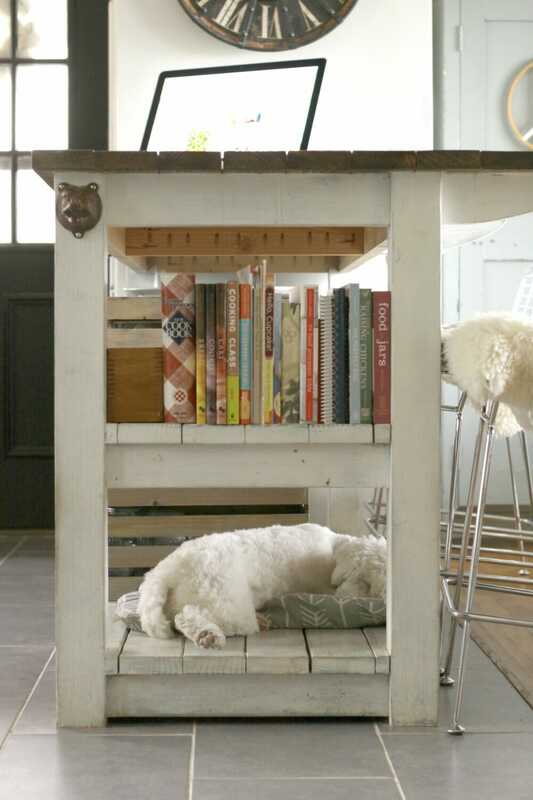 Truly, this space is small and perfect for Snowball, our miniature Schnoodle. I love when she passes out like this, oblivious to the surrounding world. She’s deaf, so it’s pretty easy for me to work around her when she falls asleep. Of course, Catcher thinks this space is just fine for him as well. He’s always trying to squeeze into the little spaces she finds. Big dog on a little bed. Finally, we have one last addition to this island, and I am sure you didn’t miss it above. I’ve been a MacBook Pro user for the last 4 years and have loved it. My kids are at the age where they now need a computer to access Google classroom, Kidblog, and some other apps at home and there have been times where sharing a computer between the 3 of us has been a challenge. Chris and I decided it was time for a new one for me, and I would pass mine onto them. Since I am now home most of the time, we decided to go with the iMac, which is less expensive than the MacBook Pro, has great storage and beautiful retina display. We finally bit the bullet this weekend (and yes, I know I am spending less this year, but this was a long time coming and planned and saved for). 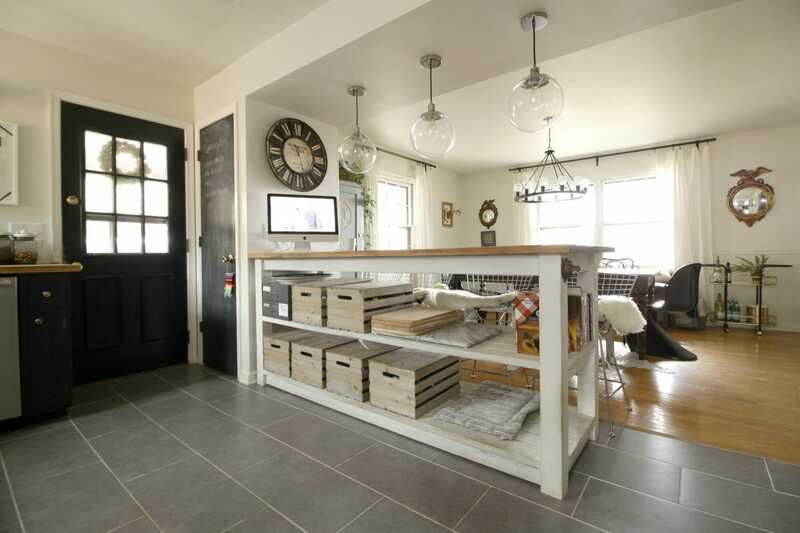 I prefer to work in the kitchen at the island because this is the area where the dogs are, where the kids do homework, etc, so it made the most sense to set it up on the end of the island. The look of a TV or computer in the kitchen isn’t something I am used to, but a friend mentioned she thought it looked modern and cool… so I am going with that. And this year I am all about embracing what works for our family and our space. Creating an office space at the island is perfect for our family. The computer itself is lightweight and easy enough to move so that if we have a dinner party we can relocate it to keep it safe from spills. It’s safe to say that everyone is happy with the changes we’ve made to this space, as you can see by the relaxed dog feet poking out on the bottom shelf. I’ve made a few other tweaks to our kitchen hardware, storage and functionality as well and I will be sharing those ideas with you over the next week as well. 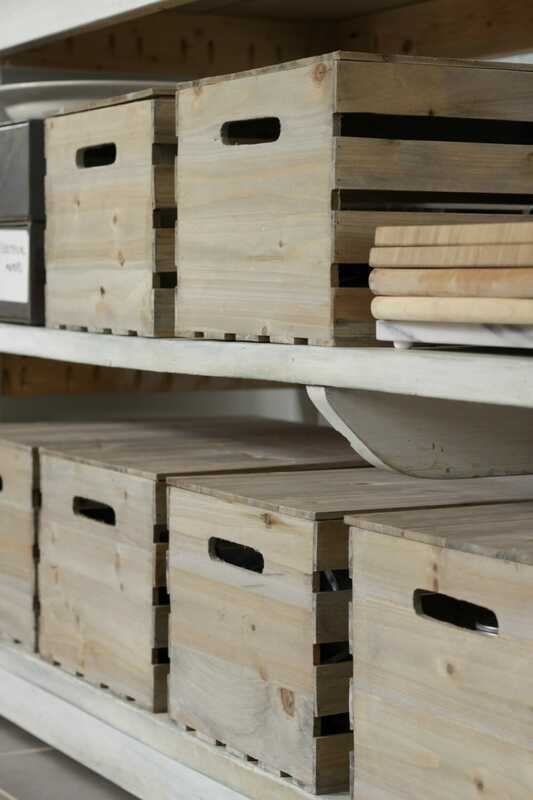 If you are looking for vintage style yet streamlined and uniform crates with lids, be sure to check these out. The look and function I wanted in my kitchen didn’t have to be sacrificed in the name or purposeful storage, and that makes me happy! Thank you again to Crates & Pallet for sponsoring my post. There are also a couple of affiliate links included for your convenience. Love, love the crates!! 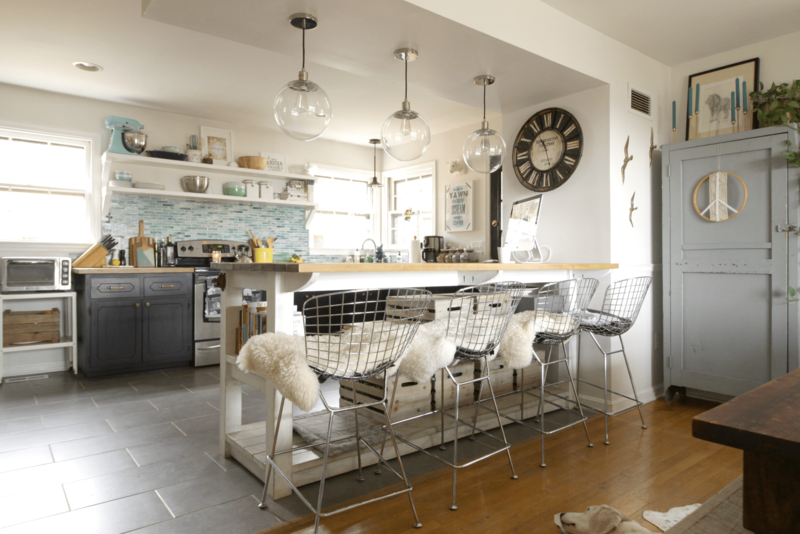 They have that style meets function thing going for them and they look perfect in your island. Those puppy’s paws. Gosh darn they’re cute! the little pink paws on snowball kill me! I love your kitchen, Cassie. The storage alternatives are so great. thank you! they really are the perfect touch! emmy picked out the ice cream sign when we were shopping and begged me to get it… ice cream is a favorite around here. so i doubt it will be going any time soon, but if it does, you are the first to know! Ha Ha, your dogs are funny. Love the new crates! Your kitchen looks great! they keep me cracking up! thank you, emily! I am new here….searching past posting and cannot find where your chairs at island are from…love them, are they comfortable? 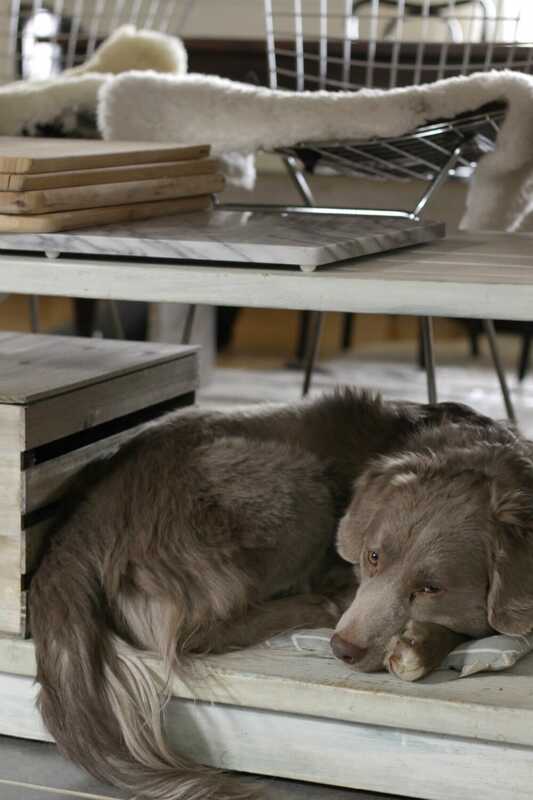 Just love seeing the dogs….so sweet. hi lisa! i haven’t mentioned the new stools yet… sorry about that! they are from scoutandnimble.com and they are comfortable! we had wooden industrial vintage stools before but now that i work from home i wanted something more comfortable. Yes the TV/computer totally looks modern and cool 😉 and I love the storage. It looks so organized and clean. this house has to work for all of us, right? The crates look perfect in your island and so does Snowball and Catcher. They are too cute! Love them! They look great! Big plus that they have a lid option. It really gives them a clean look. They’d be great for hiding toys!! isn’t she just the cutest??? i love her. i am glad yo know i am not the only one with an imac in the kitchen!!! and thank you so much!!! you’re the sweetest. This looks great! 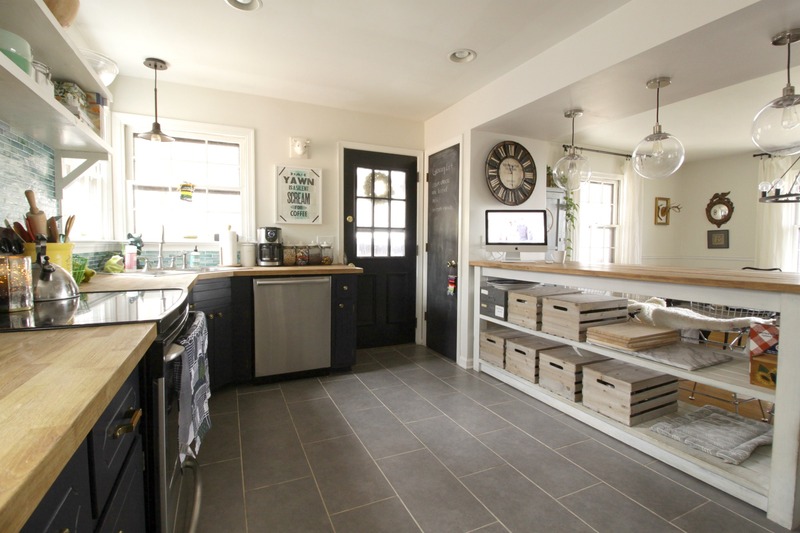 I always struggled with the open island in the barn – I needed the storage desperately, but it always felt too cluttered. This would have been a much better option. Hi, first off, I am sooooo in love with your table and it’s exactly what I want to build in my dinning room/kitchen area. You did a great job!!! Do you happen to have the plans to build this table? i do not but you can contact my neighbor at twbruns@gmail.com to see if he has them for sale. thanks!